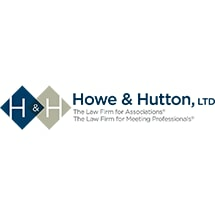 Just as law firms evolved to serve the needs of corporate clients, Howe & Hutton, Ltd. was established in 1985 to serve the unique needs of nonprofit organizations. The firm is devoted to the full service representation of nonprofit organizations - in particular, trade associations, professional societies, public charities, educational organizations, foundations, and related entities. Howe & Hutton, Ltd. has offices in Chicago, Illinois, Washington, D.C., and St. Louis, Missouri, and its client base is world-wide. Besides representing trade associations and professional societies of international, national, state, and local scope, Howe & Hutton, Ltd. is counsel to charitable and educational foundations, fraternal organizations, schools, museums, association group insurance trusts, pension and profit sharing trusts, association and society-sponsored political action committees, "captive" insurance companies, product certification organizations, controlled service corporations, title holding organizations, and similar types of groups. The name partners of Howe & Hutton alone have a joint experience of more than 70 years in the representation of trade associations, professional societies, and other nonprofit clients. This experience, coupled with that of the other lawyers in the firm, encompasses practically every issue with which such groups may be faced, from antitrust to tax matters. Please see the Practice Areas page for the areas of law covered. Howe & Hutton, Ltd. is also recognized as the preeminent firm in work involving travel, meetings, conventions, incentive programs, and the hospitality industry in general. The firm represents both for-profit and nonprofit organizations in this area. Working with corporate, association, and independent meeting planners and all types of meeting industry suppliers world-wide, the firm is highly respected for its ability to achieve positive results. Howe & Hutton has pioneered in the development of sound practices for the meetings industry, and its lawyers have written and lectured extensively in the field. Newsletter. THE HOWE & HUTTON REPORT is a monthly publication providing analysis of legal news that is important to the nonprofit and meeting industry communities. Provided free of charge to all Howe & Hutton clients, and available by clicking on Newsletter, the REPORT is a widely quoted authority that keeps the firm's clients and others aware of new legal developments that may affect them. Speakers Bureau. The firm's lawyers are available to speak at programs sponsored by its clients and others. Some of the programs at which they have addressed members of association and society clients in the past have involved, among other topics, antitrust law, travel law, contract law, governance issues, pension and profit sharing plans, federal regulation of products, hospitality industry contracts and issues, negotiation skills and techniques, Internet and intellectual property issues, executive contracts, legislative effectiveness, FTC concerns, risk management, professional liability, OSHA matters, corporate and estate planning techniques for small businesses, international trade and law matters, and federal and state tax matters. Books & Articles. Howe & Hutton attorneys have written numerous articles for client magazines and journals, and have acted as editors for books, treatises and other published material at the request of client organizations. Howe & Hutton attorneys over the years have contributed their services to many public and private endeavors that have benefited the legal profession, the nonprofit community and society. Attorneys from the firm have chaired and served on federal, state and local government task forces and advisory groups as well as bar association committees. In that capacity, they have helped to draft and revise many of the laws under which Howe & Hutton clients operate and live. All of these activities have also improved our ability to provide quality service to Howe & Hutton clients.